Rain makes December seem darker than it should. Now we turn toward the light - figuratively, spiritually, and spatially. Today I light the last of the Advent candles. Pinpoints of light sparkle on the tree. 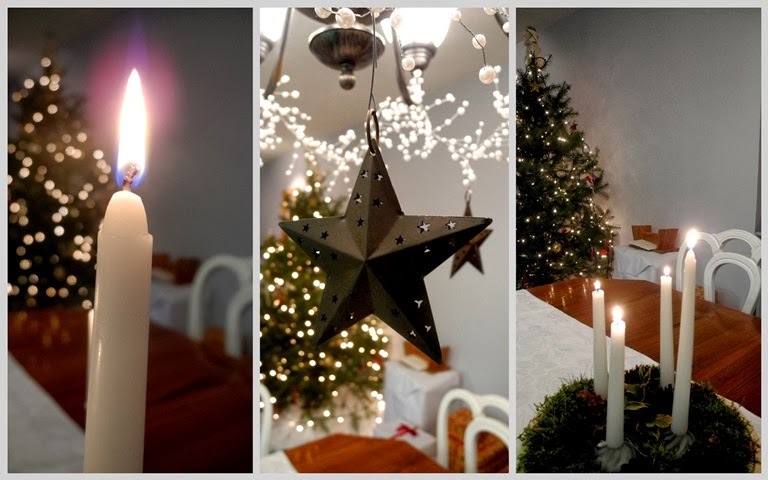 The garland and tin stars hanging from the chandelier reflect and amplify the light. Decorations around here are simple and don't change very often. I wonder if I'm getting stuck in a rut. If so, it's a happy rut and I'm not looking to get out of it. This little wooden village was cut and painted years ago, along with the tiny Nativity figures. Joseph stands less than 1.5 inches high (I just measured him.) This year, I placed the village and holy family figures together, on a low shelf where the Little Misses can play with them. I thought the plate wall needed a little Christmas. Letters cut from red cardstock did the trick. Linking to Mosaic Monday with Mary of the Little Red House. Merry Christmas to my readers and comment writers. I pray that the peace, love, hope and joy promised at the birth of the Christ Child will overflow in your lives this season and throughout the new year. Simple, but meaningful decorations. I'm sure the little ones will enjoy playing with the nativity set. I love the pretty stockings and all of your decorations. Candles make our homes so much nicer in the winter months and I love all of your twinkle lights! Merry Christmas! Oh the granddaughters must love playing with the little Nativity figures. Your decorations are beautiful and perfectly represent your Christmases with your family. That's the joy of such treasures. Merry On! I have the same lovely metal star...it's one of my fav's. Your decorations are lovely. I absolutely love the wooden nativity, and you are a wonderful grandmother to place it within the little girlies' reach! Merry Christmas to you and yours, Lorrie! Your decorations are lovely and I could see how you would be content with them. And those stocking are hung (and were made I think) by the chimney with care. Have a wonderful Christmas! Just love that mantle and that row of Christmas stockings! Have a really meaningful Christmas full of peace and joy! I have the metal stars, too. What a great way to handle to stockings. Merry Christmas, Lorrie. Love the quietly festive look - have a peaceful and happy Christmas. a lovely look into your Christmas home. My friend has a wall plate - she has been collecting for years. Have a lovely Christmas and thank you for stopping by my blog today. Your home is looking beautiful with the festive decorations. I love the mantle and stockings. Wishing you and your family a very Merry Christmas! Your mantel is wonderful! I love the greens and the matching stockings! I've been looking for a nice little Nativity that my granddaughter and future grands, could enjoy playing with. I'll have to really keep my eyes open now! Merry Christmas to you Lorrie! It's been lovely getting to know you this year! What wonderful and pretty shots! Merry Christmas, Lorrie! *Joy* is my word for the day too! Lorrie, what a lovely dispersion of light and I think your Christmas tweaking of the plate display is genius!! I love your 'happy rut' too! Blessings to you all this Christmas. Your decorations are warm and inspiring... And I like your profile picture too -- Merry Christmas!! Lovely, lovely, dear Lorrie. A warmhearted decoration! and a healthy, prosperous HAPPY NEW YEAR! And thank you very much for still reading my little blog and for all your friendly comments throughout the year! I love all your pictures with the different light! So pretty! and how did you make that great stocking hanger, and how is it attached to the mantel? I want to make some burlap or drop cloth stockings one of these years. Merry Christmas!! Merry Christmas to you, sweetie! My comment seems to have been gobbled up, between my iPad and Blogger and Google... I suspect a conspiracy. But they can't thwart my wish to send you a resounding Merry Christmas! (Or can they... Let's see what happens when I click on "publish"
Merry Christmas, Lorrie. May all the blessings of the season be yours. Lovely rut to be in. JOY is a special word that should be plastered everywhere, all around the world. JOY to you on this day after Christmas. I hope it was a special day. I'm a little late getting around but wanted to stop and tell you I love your mantel and fireplace all decorated for Christmas. I hope you had a wonderful Christmas with your family. The stockings look such fun decorations. Why change anything when what you do is special and artistic anyhow.